52 Weeks of Personal Genealogy and History: Week 36 Road Trips, American soldiers and Natural Arch. The topic for Week 36 in Amy Coffin’s and Geneablogger’s 52 Weeks of Personal Genealogy and History series is: Road Trips. Describe a family road trip from your childhood. Where did you go and why? Who was in the car? How did you pass the time? Road trips were mostly non-existent in my childhood as we didn’t own a car (Ironically Week 3 of this series featured “Cars”). However I do remember one of the day drives we did with our neighbours, Mr and Mrs Gay. He was a railway man like my father and for some strange reason whenever the car drove over a railway line they’d say “Pull up the railway line and sack all the men”. For the life of me I can’t figure out why and never have been able to! All I can think is that it may have been their equivalent of winning the Lotto and escaping work. Or perhaps it was purely ironic. 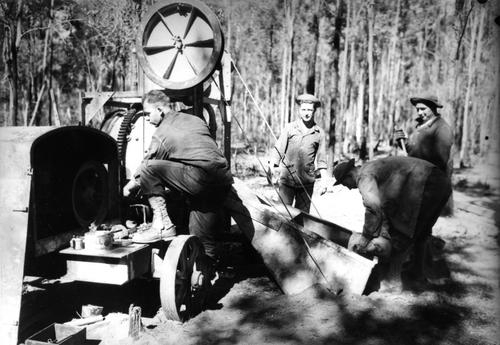 An image of American soldiers working at Camp Cable near Logan south of Brisbane c1942. 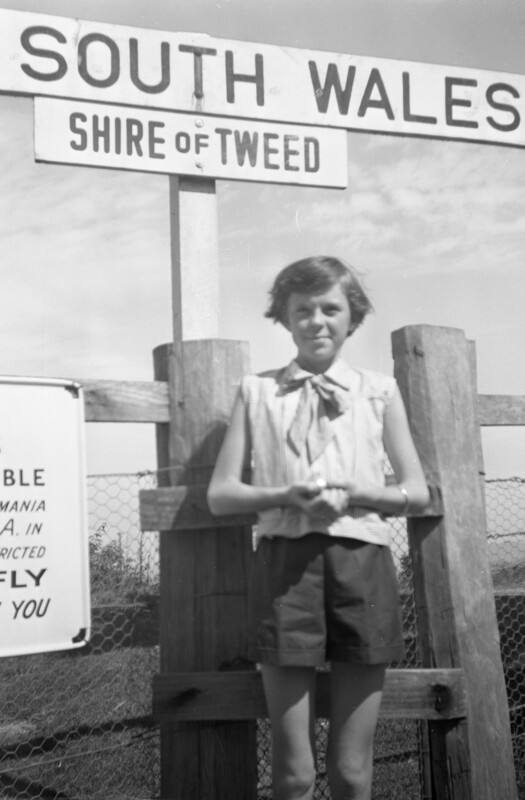 Image from John Oxley Library, State Library of Queensland, no image number. Copyright expired. Anyway when we went for a drive we’d have singalongs of old-favourite songs. Do people still do that as a matter of course? Somehow it seems symbolic of an earlier, simpler time when before in-car music systems and indeed DVD, when driving was leisurely. I know that Judy over on Jottings Journeys and Genealogy sings while driving long distances and that’s the likeliest time for me to do the karaoke-type thing….easily explained by being a really poor singer. Returning to our day drive, our ultimate destination was Natural Arch and Springbrook National Park, south of Brisbane. These days it would be a short enough drive when the freeway wasn’t busy but I remember it as something of an adventure. I guess we just took our time. Along the way we stopped at a cairn which commemorated Camp Cable which had been a US base during WWII and named for the only American soldier, Sergeant Gerald Cable, killed when their ship was torpedoed by a Japanese submarine en route[i]. I suppose it was relatively new when we visited it. Camp Cable was near the railway line, close to Logan Village and less than 10kms from Jimboomba. Dad’s grandparents, George Michael and Julia Kunkel, lived near here when George worked on that section of the line and I wonder if Dad knew this when we stopped to visit the cairn. 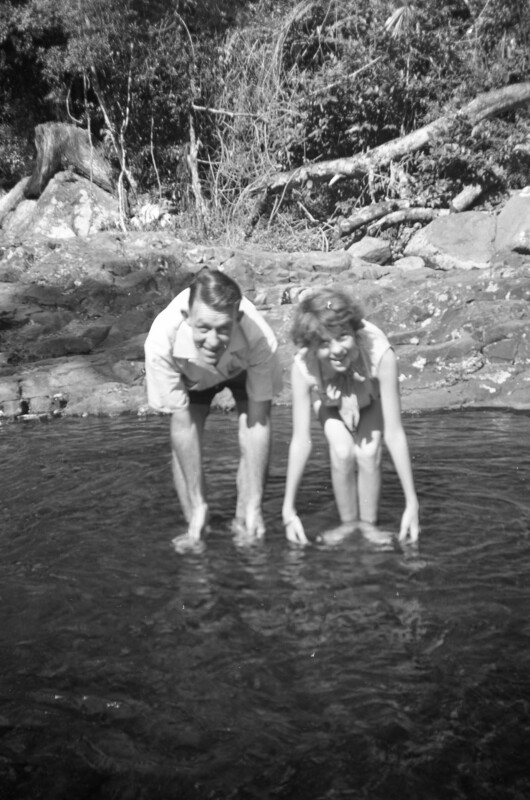 He would certainly have known the area himself from the train line as his father had worked on the Gold Coast line and we travelled it en route to holidays at Currumbin. Dad and I at Natural Arch all those years ago. Natural Arch is, as it says, a natural feature in which a waterfall comes down through the roof of a cave. There is a short walk from the park through rainforest and you can see a waterhole and creek before it drops down into the cave. If you go to the mouth of the cave, you see the waterfall come powering down. I do remember being impressed with it – so much so that when we had access to a car while on holidays from PNG one year we went back there for a visit. Sadly it didn’t have the same impact as it had when I was a child and I don’t think we’ve ever been back, favouring nearby Lamington National Park instead. Perhaps the explanation is simple: the first time we saw it there had been plenty of rain and the creek and the waterfall were flowing heavily while the second time the creek was barely trickling. It appears I was there even if I have no memory of it. How formal a photo for a picnic outing. This 52 week series frequently challenges my memory, sometimes bringing things back with great clarity and other time highlighting vast blanks. For example I have no memory of a picnic that day though we almost inevitably had one. I surely don’t remember the glow worms the web sites mention. I don’t even recall driving to the New South Wales border that day which we apparently did. Frustrating! I can’t resist a quick mention of road trips of a sort when we went on Girl Guide camps. We’d load up the girls and camping gear in the back of a four-ton truck then head off to the camp-site singing and waving and generally having a good time. Not only would it not be legal these days, I can’t imagine parents letting their kids do it even if it was. [i] I’ve learnt more about this cairn through reading the website for the 32nd Infantry Division, the Red Arrows at:http://www.ozatwar.com/ozatwar/campcable.htm.